Overview Murphy's Petrel: Large petrel, overall gray or gray-brown body and pale throat. Underwings have pale bars. Legs and feet are pale, toes have black distal webbing. Bill is black. Feeds on squid and crustaceans. Swift flight, alternates several rapid wing beats with long glides. Does not follow ships. 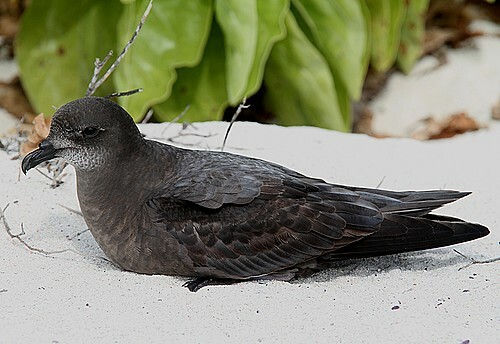 Range and Habitat Murphy's Petrel: Breeds in the Pitcairn Islands, the Tuamotu Archipelago, the Austral Islands, and the Gambier Islands. Seen annually far offshore, along the Pacific coast of Mexico, California, Oregon, and Washington. Pelagic, only comes ashore to breed. INTERESTING FACTS The Murphy’s Petrel is a rare species with very little known about it. Murphy applied the scientific name ultima, meaning last, which was rash in retrospect, as in 1963 its status as ultimate was lost with the description of Barau’s Petrel. The first specimen was collected from Pitcairn’s Oeno Island in 1922, but it was not until 1949 that Robert Murphy, a seabird biologist, described the species. A group of petrels are collectively known as a "gallon" and a "tank" of petrels.